“Sew, Let’s Quilt Along” Block 1 Release! | Sparkle On! It is with my great pleasure to announce the release of Block 1 of the Sew, Let’s Quilt Along, “Sewing Machine” designed by Sandra Healy of Sandra Healy Designs. Visit Sandra’s blog to download her free pattern and view her tutorial post. We thought that a sewing machine would be the perfect start of a sewing themed QAL and Sandra’s design is perfect! The finished block will measure 18 x 24” finished. It is a perfect size for the centerpiece if you are completing a quilt using all 13 blocks or as a wall hanging or any smaller project. As a small project host, I will present my projects as ideas for you to make on May 7th, the end of this segment. I always review a pattern completely before cutting. It helps me know what to expect and get a feeling of how the pieces go together. Follow the cutting chart and use the sewing machine schematic Sandra provides. It is a great help! I used machine embroidery for the main black thread and to secure my wheel. I hand embroidered the needle with silver thread and the spool tops with embroidery floss. If you plan to quilt this block, wait to add embellishments. I was hesitant to use my Kona solid bright pink but I am so glad I did! I love my pink machine. It’s your machine so have fun with it!!! Visit these hosts to see Sandra’s Sewing Machine in a variety of fabric and color inspirations. Host’s also provide their own tips to sewing this block. Also, all the hosts are available to provide tips and help for making each block, answer any questions and encourage you! If you complete the blocks and post your photo during a segment and before the next one starts, you will be eligible for the segment prize. To be eligible you must post your photo by May 20, 2019 by 11:59 pm (EST). Mystery Block 2, designed by April Adams, will be release on March 26th! Next > “Sew, Let’s Quilt Along” Block 2 Release! Your block is so happy! The bright pink turned out great. I love your pink machine, Abbie! It’s so great to get this qal started at last! Thank you so much Sandra! I enjoyed making it, congratulations on designing a wonderful block! This machine is so charming! In addition to the QAL, this is a great block for a sewing machine cover or a tote bag….hmmm endless possibilities! AND the control buttons are such a cute idea…great tip about quilting before adding the buttons…I would have put them on first because they are so cute! It’s so nice to participate in QALs because we get to meet new friends and learn new techniques! Can’t wait to see more! I know this block is really versatile. I’m like you and had to sew on the cute buttons. Abbie, this is such a fun block. I love the fabric you chose for this design. I am getting ready to start mine! Thanks Chela! I’m excited to have a sewing machine block, all quilters should have one right?! I’m excited to see yours. oi Abbie! amei seu bloco e suas cores. também pensei em fazer capa para as minhas maquinas de costura. antes de começar vou ler todos os posts das anfitriãs e aprender todas as dicas! What fun your buttons are! I’m thinking I might change the top a little to look more like my old Viking that I love to pieces. And that makes the machine blue and white, so I’ll have to find a great background! Thanks Suz! I’m excited to see your beloved Viking in a quilt block! So cute! I love your pink machine. I also like that you chose plaid for the spools. Clever! Abbie, your pink sewing machine is delightful!! The floral wall paper behind the machine is sew cute, too. Great tips!! 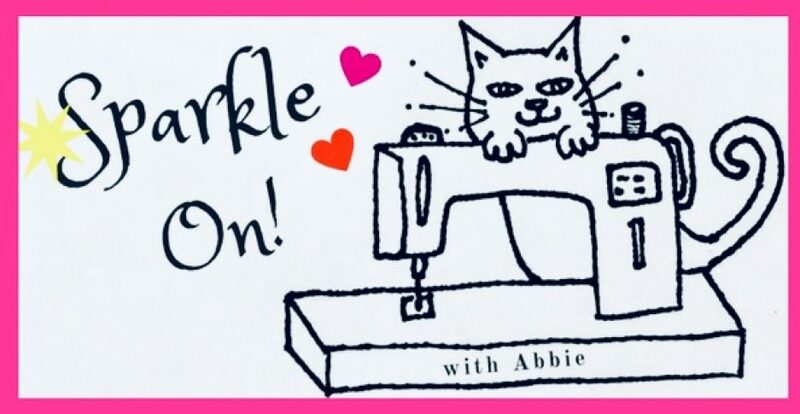 Your sewing machine makes me smile – love it!